Born in Oxfordshire in 1901, Crowe was educated at Berkhamsted Girls School and at home by her mother. The family moved to Sussex, and after 1912 Sylvia spent much of her time on her parents' farm as ill health prevented her from attending school. She attended Swanley Horticultural College from 1920 to 1922 and then worked as a garden designer. After training in horticulture and an apprenticeship with Edward White at Milner, Son and White she spent 13 years working as a landscape and garden designer for the nurserymen and garden contractors William Cutbush until the outbreak of the Second World War. 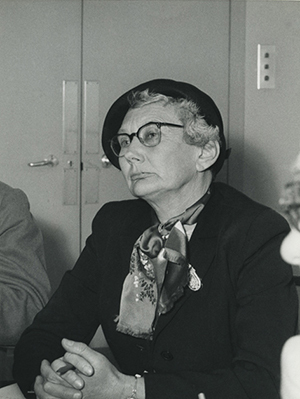 She joined the Institute of Landscape Architects (ILA) during this period and was elected onto Council in July 1939. (link http://www.landscapeinstitute.org/PDF/Contribute/SylviaCrowepreface.pdf) She served with the Polish army in France during World War 2, and entered private practice as an architect in 1945. In the late-1940s she worked on the green spaces in a number of new towns, and was later the consultant for landscapes surrounding utilitarian buildings such as hospitals, training colleges, research stations and reservoirs. Particularly well-known are her landscapes at Rutland Water and the Commonwealth Institute. Her book The Landscape of Power was published in 1958, a time when the first generation of nuclear power stations were built. She was president of the Landscape Institute, 1957-59, and did notable work in the landscape design of Harlow and Basildon New Towns. At the age of 62, Crowe was appointed as the Forestry Commission’s first landscape consultant in late 1963. According to the Commission’s website (http://www.forestry.gov.uk/forestry/CMON-4UUM6R), following her advice, ‘landscaping began to be considered on a far wider scale, resulting in woods which were aesthetically pleasing as well as productive’. She wrote a series of books confronting the challenges of new landscape issues, and her textbooks on garden design are considered classics. Sylvia Crowe died on 30 June 1997. Sylvia Crowe, Tomorrow’s Landscape, 1956. Sylvia Crowe, The Landscape of Power, Architectural Press, 1958. Sylvia Crowe, Space for living: landscape architecture and the allied professions (ed. ), 1961. Sylvia Crowe, Shaping Tomorrow’s Landscape, 1964. Sylvia Crowe, Forestry in the landscape, 1966. A portrait of Sylvia Crowe is held at the National Portrait Gallery, London. Material relating to the Commonwealth Institute can be found in the James Gardner Archive.